sailboat. 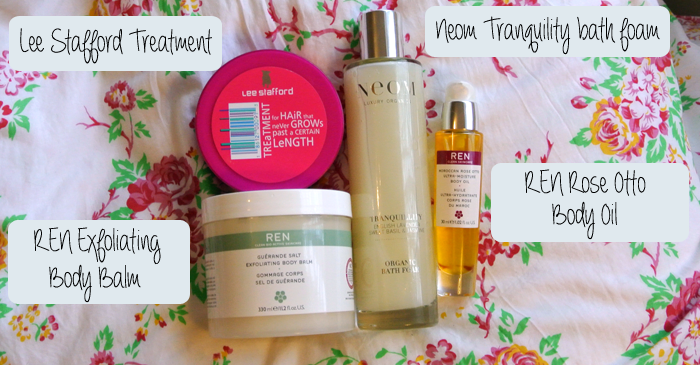 : Favourite Skin, Hair & Body Care from 2012! 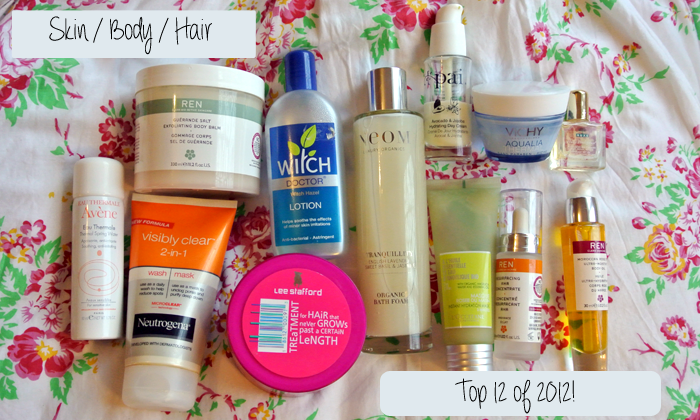 Favourite Skin, Hair & Body Care from 2012! Last year was the year I got into skin care, researching different products and finding ones that really work for me. My skin type is a bit of a strange one if I'm honest, it's dry & dehydrated but can get easily clogged up with product causing those annoying little spots. It's also pretty sensitive, not so much to products but more to the weather so it's very affected by the change in seasons. At the start of the year I had a lot of redness and acne scarring, both of which has been reduced dramatically thanks to a few wonder products! There are also a few body products that I think are wonderful in here as well as one hair product, what can I say? I'm not that into hair stuff really! Witch Hazel Lotion or Gel. // Avene Thermal Water. // L'Occitane Angelica Instant Hydration Mask. // Neutrogena 2-in-1 Wash & Mask. The first product is plain & simple witch hazel. I've tried a lot of spot treatments in the past but witch hazel works the best for me without being too drying. If I'm having a particularly bad skin time I'll take a bit on a cotton pad and use it all over my face, but usually I'll just apply it to specific areas. It's not a miracle worker, but it does manage to take down a lot of the redness very quickly and it never feels overly harsh or stripping. Avene is one of my all time favourite skin care brands, I love a lot of their products and the one that stands out to me, the Thermal Spring Water, is one of their most simple & affordable options. I always buy the mini size so I can keep it in my bag and I use it as a refreshing spray or whenever I feel my make up is looking a little worse for wear. This is an absolute life saver in the warmer months because I find it really soothes my skin if it's feeling irritated, but I also use this all year round as part of my night time skin care routine. The L'Occitane Angelica Instant Hydration Mask is a product I originally received to review and I've since gone on to repurchase. If my skin ever feels dry or starts to look dull and is in need of some moisture quickly, I always reach for this. You only really need to leave it on for a few minutes to see results, so even if you're in a rush there's still time to use it. I also think this would be amazing to take if you're going on a long flight because it goes on clear so you won't have to worry about getting odd looks from fellow passengers. I would go so far as to say this is the best mask I've ever tried. For times when my skin has been really bad I turned back to an old favourite, the Neutrogena Visibly Clear 2-in-1 Wash & Mask. I'm sure this doesn't contain the best ingredients but you know what? It bloody works and it's so affordable. I wouldn't recommend using this a lot if you have dry skin like I do because it can be drying if used daily, but used sparingly even just on specific areas of the face I think it's amazing. Cheap and cheerful! One of my all time favourite moisturisers is the Vichy Aqualia Thermal Rich Moisturiser, not because it's anything super fancy that promises to iron out every wrinkle, make you look like you've had a face lift or turn you into Kate Moss, but because it's reliable, it works perfectly and leaves the skin feeling wonderfully hydrated. It's gentle and hydrating without being oily or greasy. They also do a light version which I think would be perfect for a less dry skin type. It works. I love it. The Avocado & Jojoba Hydrating Day Cream from Pai is a product that has really intrigued me because it's quite thick but it's not oily in the slightest. It doesn't have any slip to it which makes it perfect for underneath make up as it fully hydrates any dry patches of skin but sinks in instantly leaving no shine. The only thing that bothers me is the packaging, I'm not sure that a bottle with a pump is the best because it is quite thick. I get that it's more hygienic that way etc but I just love creams in jars. The REN Resurfacing AHA Concentrate is my miracle product of the year. I feel like I want to stand on the rooftops and tell the world how AMAZING this product really is. If you have acne scarring or dull looking skin you need this in your life. It's essentially a chemical exfoliator (which isn't as scary as it sounds!) and if you're persistent with it, I can almost guarantee that you will see a difference in your skin within a month. I have a whole post about it which you can read here and I'll say that although it seems expensive, a bottle will last you such a long time and it's so worth it! I will always have a bottle of this for as long as they keep making it, I already have a back up ready and waiting! The Nuxe Dry Oil is something I discovered through GlossyBox and I didn't use it very much at first but then I realised how utterly amazing it is at pretty much everything. I've used this on my face if I have a particularly stubborn dry area, I've used it on my legs after shaving to soothe the skin and I've used in on the ends of my hair if they were looking a bit dry. It's not greasy, not too much and it has a really delicate scent that doesn't linger for an uncomfortably long time. I love this! The one hair product I wanted to mention is the Lee Stafford Treatment For Hair That Never Grows Past A Certain Length. Okay, so it's the product with the longest name in the world and these little tubs are a little overpriced in my opinion, but I really do think it works. It's clearly not a miracle worker, but I do think it works wonders at improving the condition of the hair, making it stronger and this ultimately makes it grow. I use this once or twice a week fairly sparingly and I think it's great. It's one of the only hair products I'm totally loyal to, everything else I usually just go for whatever's on offer at the time. It's taken a long time, but I've finally found something to replace the scrub from Naked Bodycare that I loved so much and they so cruelly discontinued and it's the REN Guerande Salt Exfoliating Body Balm. REN is such a consistent brand and basically what I mean by that is all their products are amazing. If I'm honest I'm not crazy about the scent of this, it doesn't really smell of very much but I don't even care because it leaves my skin feeling incredible. It's not a scrubby scrub, it's relatively gentle but it's perfect for me and most importantly it's hydrating! I was going to say it leaves a bit of an oily residue on the skin but that makes it sound horrible and it's not. It doesn't leave my skin feeling greasy, it just allows me to skip moisturiser if I'm feeling lazy (which is all the time) and I LOVE it. I know there's a Rose body scrub that I think I'm going to try next! Thank you REN. I love you but I hate you. And I only hate you because now I'm addicted to your products and I want to try more. I want to try all of the products! Yeah. If you love to take bubble baths and you love to indulge in fancy bath products every now and again you need to try the NEOM Bath Foam. I use this on evenings where the day has been particularly stressful to really relax before bed and clear my head of, well, pretty much everything. This has lavender in it which honestly, I usually hate, but in this it's almost a very subtle and sophisticated lavender scent and I'm always happily in the land of nod within an hour after a bath with this. It comes in a beautiful glass bottle, everything about NEOM products screams sophistication and something like this would make a beautiful gift! Finally another REN product that I only discovered towards the end of the year but I love so much that I couldn't not include it here. The Rose Otto Body Oil is absolutely perfect if you're like me and hate moisturising after a shower because you're a little bit lazy or don't want to wait around for what seems like an eternity before getting dressed. A few spritzes of this, a few seconds and your whole body feels hydrated and you can get dressed pretty much instantly. It feels luxurious on the skin, the rose scent is beautiful and very classy. It's really lovely and definitely one to try if you like body oils! Well, if you made it through all of that then you deserve a medal! Skin care is definitely a very subjective thing, what works for me might not work so well for you and I always recommend doing a bit of research before investing in a product! This is why beauty blogs are so wonderful, you can easily get multiple opinions on something and then you can decide whether it's something you think you would like! What were your favourite skin, hair or body care items from last year? Facebook. // Tumblr. // Twitter. // YouTube. I've only just discovered the avene spray a few weeks ago but it's done wonders for my reactive skin! It's all kinds of wonderful. I really want to try the lee stafford mask as I regret having my hair cut! Looking after your skin is SO IMPORTANT.... years of working for Clarins taught me that!! Have you tried the hydrating creams from Clarins? They are really hydrating and don't clog what so ever! I love Skincare! The way you describe everything is so lovely, you make me want it all! In particular, the L'Occitane mask and the REN AHA thing sound amazing..
My favourite would have to be the Rituals whipped body cream, it is just perfect for my skin type. I too didn't think a whole lot on the Nuxe oil when it came in my Glossybox but over the past few weeks I have found it a god send on the dry patches I get on my knees, ankles and elbows. Hopefully it will help get my 'dry bits' 'showtime ready' for when the summer comes! I'm intrigued to try REN products, hopefully I can locate them in an online store- I need that AHA exfoliator! One of my favourite products of 2012 was a Clarins sunscreen named "UV plus HP day screen spf 40". I'm very fussy with face sunscreens and I use one daily, so it has to look undetectable and blend into nothing! This one by Clarins is perfect for my oily skin. i wish i was as good at cosmetic's topic as you are. I would love to try some REN products! 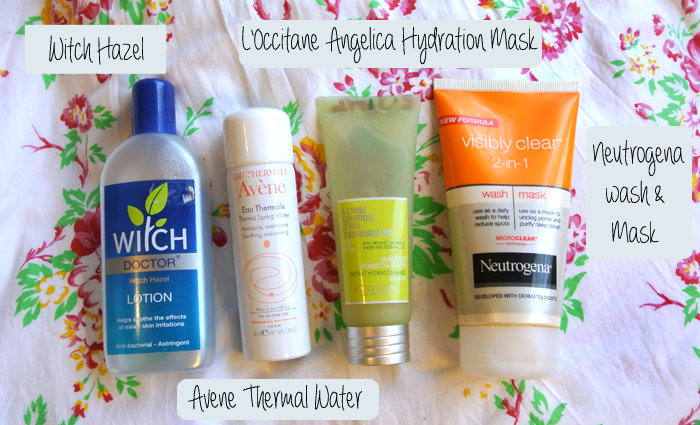 Lovely post, I really like Avene products. This year I discovered moisturizing gel creams & I fell head over heals for the Kiehl's Ultra Facial Oil-Free Lotion. And Caudalie's hydratation serum.. So lovely! I really want to try ren skincare! Heard so much about it! If you're using the Pai cream with jojoba oil in it, maybe you'd like pure jojoba oil? I also have dry, sensitive skin prone to spots, and I've been using jojoba oil every night for a month and my skin has cleared up no end and I don't get flaky patches halfway through the day! You can get a bottle for about £10 on Amazon from a brand called Fushi, I cannot recommend it enough. I did a blog post on it if you're interested in reading a little more. i also love the avene spray, it's a life saver when it's hot! I loved this post because there's nothing I enjoy more than having a nosey into people's skincare routines and finding out which products really work for them. I have just got the NUXE dry oil, but haven't tried it yet, so looking forward to that. 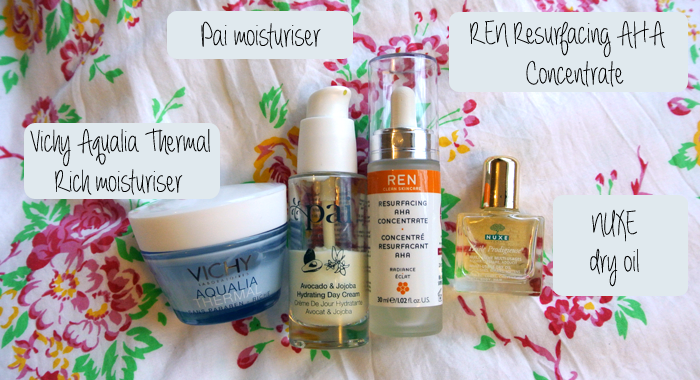 I have also been interested in the Ren AHA for some months now, but am undecided on whether it would do much for me as my skin is pretty ok. Love the sound of the L'Occitane mask, can't believe I hadn't heard of that one before. And as for Pai, have you tried their Camellia and Rose Gentle Hydrating Cleanser? I think it's possibly my favourite cleanser I've ever used, so highly recommended. Hope you're well lovely, Happy New Year. Favourite Make Up Products from 2012. 01.01.13 - Sailboat Turns Three & Happy New Year!